Authored by and photographs by James F. Dill, Extension pest management specialist and David T. Handley, Extension vegetable and small fruit specialist. Revised April, 1996. Replaces Vegetable IPM Fact Sheet 401, Monitoring for Sweet Corn Pests, Bulletin #5401. Where brand names are used it is for the reader’s information. No endorsement is implied nor is any discrimination intended against products with similar ingredients. Always consult product labels for rates, application instructions and safety precautions. Users of these products assume all associated risks. There are three major insect pests of sweet corn in New England: European corn borer, corn earworm and fall armyworm. All spend their adult life as moths, but the damaging stage of the insects are the larvae or caterpillars, commonly referred to as “worms,” which feed on the leaves, stalks and ears of the corn plants. Of the three species, only European corn borer can successfully overwinter in most of New England. Moths of the corn earworm and fall armyworm fly into New England from southern states during the summer. Integrated pest management (IPM) strategies developed for these insects are designed to maximize effectiveness and efficiency of control programs while reducing amounts of pesticides used and increasing profitability. 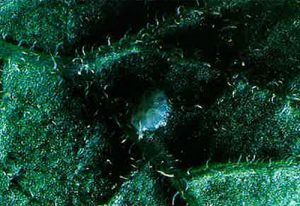 An IPM program consists of 1) monitoring the populations of the major pest species in each field; 2) using action thresholds based on pest populations to determine when a spray should be used to control a pest; and 3) when possible, using an effective and safer alternative to reduce pest populations. In the past, pest control has largely been accomplished by applying pesticides according to the stage of growth of the plants (e.g. tassel or silk) with little or no regard to actual pest populations in a field. By monitoring fields for pests and injury, and using action thresholds to decide when to spray, the amount of pesticides used is often significantly reduced, and the amount of corn lost to insects is also reduced, leading to a higher profit margin for the crop. The European corn borer (ECB) moth (Ostrinia nubilalis) is about one inch long with a wingspan of about one inch at rest (see Figure 1). The moth varies in color from yellowish brown to dark tan with two dark, irregular, wavy bands across the front wings. 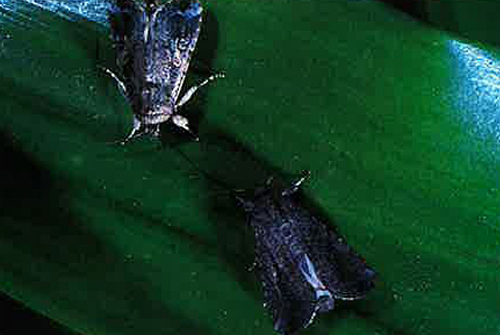 The male moth may be somewhat darker in color and slightly smaller than the female. The tip of the male’s tufted abdomen usually protrudes beyond its closed wings. European corn borer moths emerge in mid to late June. The moths spend the daylight hours hiding in grassy areas. On warm nights, they fly into sweet corn fields to lay their eggs. They may also lay their eggs on other hosts, such as beans, broccoli, peppers, potatoes, dahlias and many weeds. 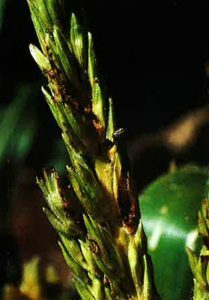 The eggs, in masses of up to 50, resemble overlapping fish scales and are usually found on the underside of the corn leaves (see Figure 2). The eggs hatch in four to nine days. Just before hatching, the eggs turn black because of the darkening of the larval head capsule. The newly hatched larvae are very small (1/4 inch) and translucent yellow with a dark, shiny head (see Figure 3). As they develop, they become larger and darker in color. Fully grown larvae are 3/4 to one inch in length. They are usually flesh colored but may range from light pink to tan or gray, with conspicuous small, dark brown spots on each segment. 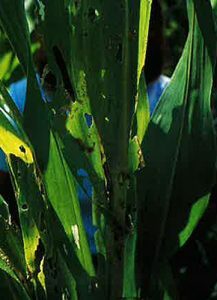 The larvae feed on the corn leaves, frequently in the whorl, causing a characteristic “shot-hole” injury that becomes most apparent when the whorl leaves unroll (see Figure 4). The larvae will also tunnel into the tassels and stalk, weakening them and sometimes causing them to break (see Figures 5, 6). The tunneling habit makes control at this stage very difficult. On more developed corn, the ECB larvae may enter the ear at the base, side or the tip through the silk channel. At the end of the season, the full-grown larvae remain in the corn stalks and stubble throughout the winter. In the spring, the larvae pupate and emerge as moths in about two weeks. Plowing corn stalks and stubble under at the end of the season is an effective and important means of controlling the ECB. Whorl Stage (eight leaves): Scout 100 plants per field or block (20 plant samples in five locations). Look for shot-hole injury in the leaves. A treatment is recommended if 30 percent or more of plants scouted show fresh feeding injury. Pretassel stage: Scout plants as above, look for feeding damage on the leaves and in the developing tassels. A treatment is recommended if 15 percent or more of the plants scouted show injury. 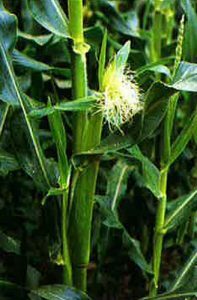 Tassel-silk stage: Scout plants and, as above, look for fresh feeding injury on leaves, in tassels or on the sides of ears, especially where the ears meet the stalk. 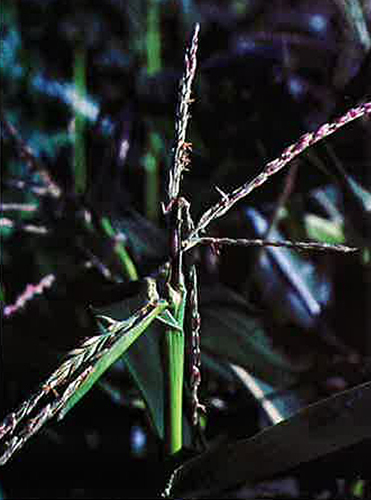 Give the stalk a gentle twist near the ear to detect larvae in the stalk. A treatment is recommended if 15 percent or more of the plants scouted show fresh injury. Pheromone traps: Two Scentry Heliothis® traps or traps of similar design should be placed in grassy weeds bordering the field, spaced at least 100 feet apart. One trap should be baited with Scentry® ECB I (NY strain) pheromone (or equivalent). The other trap should be baited with Scentry® ECB II (IA strain) pheromone (or equivalent). In young corn (whorl-tassel), these traps should be used to judge the emergence of ECB, i.e. no spray threshold. In silking corn that has not yet been sprayed for corn earworm, a treatment is recommended to protect the silks from egg-laying ECB moths if five or more moths are caught in the pheromone traps in a week. The corn earworm (CEW) moth (Helicoverpa zea) has a wingspan of approximately 1.5 inches (see Figure 7). The body of the moth is buff to grayish brown in color, with a dark spot in the center of each front wing and dark bands near the back of the wings. The hind wings are lighter tan with a dark band along the outer margins. The larvae vary tremendously in color, ranging from yellow to green to brown or even purple (see Figure 8). Alternating dark and light colored stripes run the length of the body. The head of the newly hatched CEW is black, but it turns yellowish brown as the larvae mature. The larvae are also covered with many small bumps, each with a small, sharp spine. These bumps and spines give the body a rough appearance, unlike the fall armyworm, which has a smooth body. Fully grown, the CEW larva is slightly more than one inch in length. 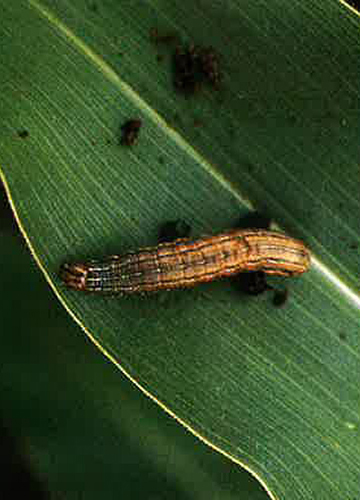 Corn earworm is distributed worldwide but cannot overwinter in the northeastern United States. The moths migrate to Maine from southern states around mid-July. 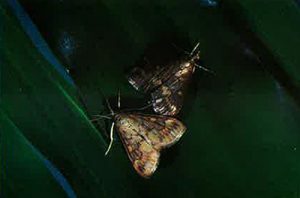 The night-flying female moths search for fresh (green) corn silk on which to lay their eggs (see Figure 9). The eggs are laid singly on the silk, although several may be laid on one silk mass. Each female can lay several hundred eggs. If fresh silk is not available, they may lay eggs on other hosts such as tomatoes or peppers. The eggs hatch in two to 10 days. The newly hatched larvae feed on the corn silk, working their way down the silk channel to the tip of the ear. Once there, the larvae feed on the silk and developing kernels. The feeding area becomes filled with moist waste. This damage causes severe economic loss, and may go unnoticed until harvest. Because corn earworm moths lay their eggs on the silks and the larvae crawl directly into the ears, field scouting is not an effective way to monitor for this insect. Therefore, control recommendations are made based on the number of corn earworm moths caught in pheromone traps on a nightly or weekly average. 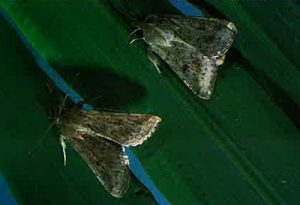 Scentry Heliothis® traps or Harstack 50:33 or 50:25 traps are currently recommended. The traps should be baited with Hercon® Helicoverpa zea or an equally effective pheromone. Place traps in corn fields just as the fresh green silks begin to appear. Place traps so that the base is at the same height as the silks. Traps should be checked at least once a week until the first CEW moth is caught, and checked two to three times a week thereafter. 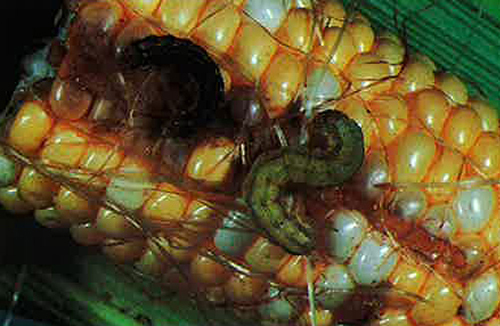 A treatment is recommended on any fresh silking corn when the first corn earworm is caught. Spray intervals after the initial application should be based on the number of moths caught on a nightly basis. The fall armyworm (FAW) moth (Spodoptera frugiperda) is about 1/4 inch long with a wingspan from one to 1 2/3 inches. The front wings of the male are brown to dark gray, and mottled. A slanting white bar occurs in the middle of the wing. The hind wings are grayish white and may have a purplish color, especially when viewed at a slight angle in sunlight. The female moth’s coloration differs from the male’s. The front wings are brown to dark gray but lack most of the mottling and the white bars. The hind wings are similar to those of the male (see Figure 10). The larvae are smooth skinned, and vary in color form tan to green to nearly black. Three thin, yellowish white lines run the length of the back. On each side, next to the yellowish lines, is a wider dark stripe and below it, an equally wide, wavy, yellowish stripe with red markings (Figure 11). The larva also has four dark spots at its posterior end. The FAW closely resembles the true armyworm, but usually has a prominent white inverted Y on the front of its dark brown head. However, the Y marking is not always prominent enough to serve as a reliable characteristic. 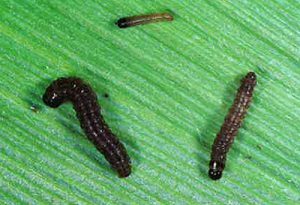 FAW larvae may also be confused with corn earworm larvae because of its similar appearance and habits. Fall armyworm is found throughout most of the United States east of the Rocky Mountains, but it does not overwinter in the Northeast because the pupae cannot survive where the ground freezes. When the moths emerge from their overwintering sites in the spring, they slowly make their way northward. Arrival time in Maine varies due to prevailing winds or storms, but it usually occurs in early to mid- August. The moths lay green to gray eggs in clusters of 50 or more and cover the egg masses with body hairs. The moths prefer to lay eggs on young corn. The eggs hatch within 10 days, and the newly hatched larvae begin feeding voraciously on the whorl, tassels or ears, leaving large, ragged holes and masses of sawdust-like excrement (see Figure 12). The FAW does its most serious economic damage by feeding on the ears, although feeding on the leaves is most commonly noticed. After the larvae have reached maturity (in about two to three weeks), they crawl down to the ground and pupate in soil near the plant’s base. Within two weeks, the moths emerge. Only one generation is completed in the Northeast, as the partial second generation ends either with the larvae being killed by frost or the pupae being killed when the ground freezes. Whorl to silk stage: To scout for FAW, check 20 plants in each of the four corners and one location in the center of the field for a total of 100 plants (see Diagram 1). This will give a good representation of the field as a whole. Look for the large, ragged holes in the leaves and sawdust-like waste, then see if you can find live larvae to be sure the damage is fresh. After you have scouted, simply take the number of damaged corn plants out of 100 and you have the percentage of damaged corn. 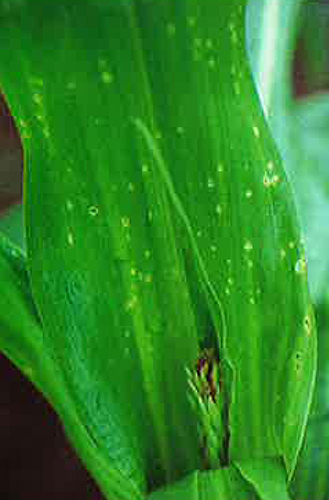 A treatment is recommended if 30 percent or greater of the plants scouted show fresh damage. If European corn borer damage is also found, include it as part of the percent injury. For example, if scouting reveals that 22 percent of the plants show FAW injury and 11 percent of the plants show ECB injury the total injury level is 33 percent, which would exceed the action threshold, and a control measure would be recommended. Silk stage: Once the corn has reached the silk stage, the threshold for treatment should be lowered to 15% of plants in the field showing feeding injury. Pheromone traps are available for FAW moths, and may provide some indication of fall armyworm activity in unsprayed fields. Scouting a corn field for pest problems should be kept simple, but it must provide accurate information. Fields should be scouted using an “X” pattern whenever possible. This will provide a sample that most closely represents the entire field. First, select five locations in each field, one at each corner of the field and one approximately in the middle, forming an “X” (see Diagram 1). At each location, examine 20 consecutive plants for evidence of feeding damage and/or live larvae. This will give a total of a 100-plant sample, and therefore, the number of damaged plants will equal the percent damage which will be compared to the action threshold. Begin scouting at least 75 feet into the field. Avoid collecting data from the field edges because these do not typically represent the whole field. Select the starting point for a sampling location randomly; do not look for a particular plant. When you reach the general area, look away from the plants, walk a few paces forward, then reach out and touch a plant. Use this plant as your starting point. Be sure to include all side shoots or tillers as part of the plant. When scouting a field, try to make sure that your samples represent as much of the field as possible. Remember, the pest population may not be evenly distributed throughout the field; there may be “hot-spots” of pest populations. If large fields (60 acres or larger) are being scouted, they should be divided into smaller units. A 60-acre field should be divided into two 30-acre units. If a corn field was under two or more different management systems the previous year, each area should be scouted separately because insect, disease and weed problems may differ depending on the previously planted crop. For example, if a 20-acre corn field had been planted to 10 acres of corn and 10 acres of potatoes the previous year, it should be sampled as two 10-acre fields. Monitoring sweet corn fields for insect pests should be done regularly, usually once or twice a week, beginning at the whorl stage or after moths are caught in pheromone traps. Fill out scouting reports for each visit. List pest populations and management recommendations based on the action thresholds provided in this bulletin. Field scouting gives you an estimate of the population of larvae in a field or the amount of damage they have done. Another method of estimating the status of a pest in a field is to monitor moth populations as they move into a field to lay their eggs. Sampling the rate at which moths are moving into a field can help you to estimate the potential injury their offspring will cause and decide what control measures to use. You can sample moth populations by using pheromone traps. These traps are typically plastic nets or containers placed in or near the corn field and baited with a chemical attractant called a pheromone (see Diagram 2). Insect pheromones are very specific, and usually only attract a single species. 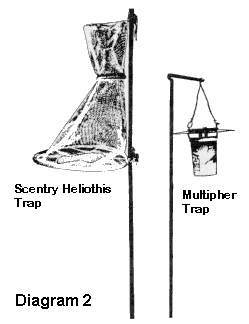 This greatly simplifies the problem of proper insect identification associated with other trap types, such as blacklight traps. The pheromones are usually placed in a small piece of plastic or rubber, which is placed in the trap to attract the moths. The pheromones used are chemicals female moths excrete to attract male moths. Therefore, only male moths are caught in the traps. The traps by themselves do not offer a means of controlling these pests, but are very useful as a monitoring tool.